After being coerced into a false confessions and convicted in 1996 of a crime they didn’t commit, Eric Kelley and Ralph Lee spent 22 helpless years growing up in prison. It wasn’t until 2018 that the right people — and technology — were able to set the record straight and free the two innocent men. In 1993, Paterson, New Jersey video rental store employee Tito Merino was stabbed to death during a robbery of the store. By the time police arrived, the murderer had fled. While there was little evidence at the scene of the crime, investigators discovered a green and purple plaid baseball hat near the back room where Merino lay. The investigation focused on a single black assailant who, according to witnesses in the store, was wearing the hat. Witness testimonies led the police to Kelley and Lee, two African American young men. The pair was questioned separately for several hours. Kelley, who suffers from cognitive impairments due to a brain injury, allegedly admitted to the crime. Detectives then fed the information to Lee. Kelley’s and Lee’s statements were contradicted by evidence at the scene. Despite this, they were charged with the murder and jailed to await trial. When the FBI examined and tested the hat, DNA analysis was in its infancy. Interpretation of the DNA results by the FBI was not definitive because one genetic marker was tested, a limitation of the technology of the time. Even with a lack of physical evidence, Kelley and Lee were both convicted of murder. In 2010, after more than 15 years in prison, the case was picked up by the Innocence Project. Retesting of the hat was performed by the New Jersey State Police Crime Lab (NJSPCL) in an attempt to recover the biology of anyone who had worn the hat. The NJSPCL was unsuccessful at recovering any useful amount of biology/DNA from the hat. 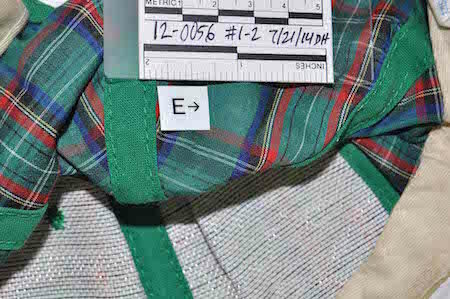 The evidence eventually made its way to a scientist at Forensic Analytical Crime Lab (FACL), who re-examined the green and purple plaid hat found at the scene. 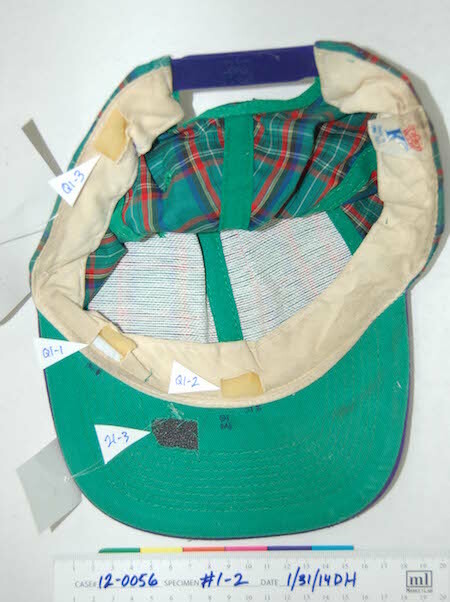 Additional samples were taken from the hat’s material; stain E on the inside surface and area H, an accumulation of biology around the inside button. While the DNA from these samples was highly degraded, a combination of the Identifiler and MiniFiler test kits uncovered a single unique male profile from both of these samples. Kelley and Lee did not match this profile. A search of the profile in CODIS, a database of forensic profiles maintained by the FBI, eventually identified a man of the same age and physical description of the 1993 video store eyewitness accounts who lived in the area at the time. This individual had just been released from prison three months before the Merino killing after serving time for a knifepoint robbery of a nearby business. As a result of Eric Kelley and Ralph Lee’s DNA exclusion by FACL, as well as the identification of the unique male profile from the hat, they were formally exonerated of their convictions in April 2018. The two men were finally freed after suffering more than 24 years of injustice. Kelley and Lee’s unwarranted time behind bars is no less than a tragedy. The ultimate result of this case exemplifies the importance of preserving aged evidence, the usefulness of biological material and DNA on aged evidence, and the significant differences in approach and skill between forensic analysts and laboratories in the discovery and successful testing of relevant biology from the same specimen. Thankfully, with the help of FACL and several dedicated experts, the two innocent men are now able to resume their lives and enjoy the freedom they should have never lost in the first place. For more information see the Innocence Project’s write-up. Forensic Analytical Crime Lab helps law enforcement and attorneys solve the most difficult and challenging cases. Our multidisciplinary team of scientists in pathology, neuropathology, DNA analysis and criminalistics has worked on hundreds of criminal cases and helped exonerate over 50 wrongly-convicted defendants.